Make your reservation now to stay near one of Frommer's top destinations in 2010 - and one of Yahoo's best beaches in the world - the beaches of the Florida Panhandle at Santa Rosa Beach : "Stunning beaches, nature trails ... great restaurants, and a cozy, yet quirky, sense of community." -- Lesley Abravanel, author Frommer's Florida. 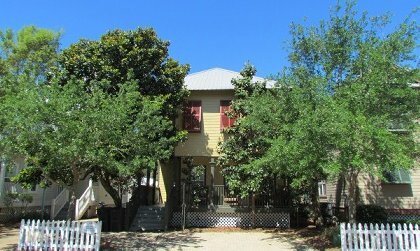 Sweet Magnolia is like no other house in Old Florida Village! Unlike many homes in this area, this home was never built for rental - so numerous luxury upgrades were included - one of many reasons this home has a high demand for rentals every year - many return again after their first visit! Furnished with designer furniture,including the porch, this Florida cottage is nothing short of luxurious comfort and class with a touch of beach coziness. Also, one of the neighborhood's two pools is located only three houses away! The downstairs has 20" porcelain tile laid on the diagonal while the upstairs has thick upgraded carpet. There is crown molding throughout, custom painted cabinetry, plantation shutters and all the plumbing and lighting fixtures (almost all lighting is connected to dimmer switches) have been upgraded including 25 recessed lights for a true luxury feel. 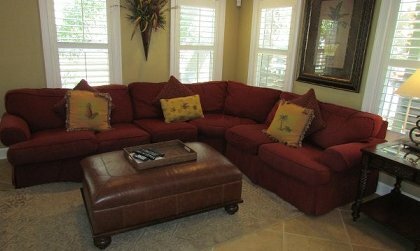 The living, dining and kitchen areas are downstairs and have been professionally decorated with up- scaled comfortable and cozy furnishings. All three bedrooms are located upstairs giving you peace and quiet for those long afternoon vacation naps! 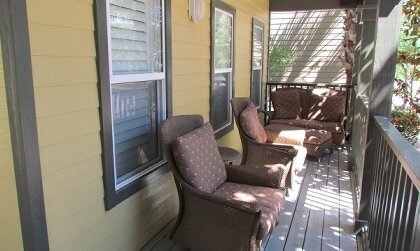 Also, Sweet Magnolia has three porches for enjoying those warm summer nights. 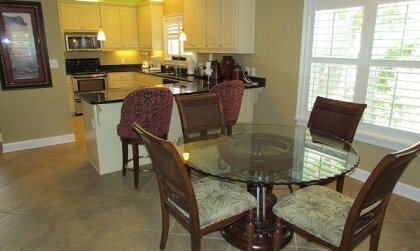 Of all the various floor plans Old Florida Village has to offer, this house has the largest kitchen which makes cooking big vacation meals fun and easy for all. 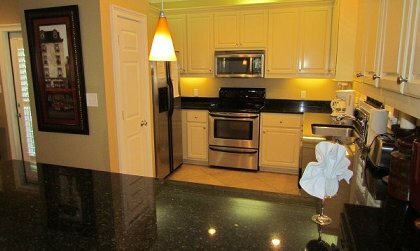 The kitchen has granite countertops, stainless steel appliances and an oversized under-mount stainless steel sink. The master bedroom is also the largest compared to all of the other floor plans, featuring a king size bed and a spacious walk-in closet with double shelving. There is also a private balcony accessed only through the master bedroom. 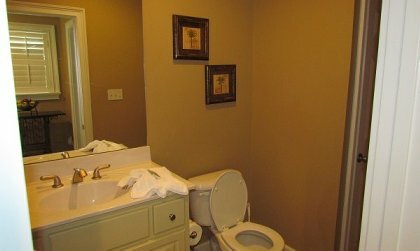 The master bath has a large shower with dual shower heads and a corner seat. The second bedroom has a queen size bed and the third bedroom has four bunk beds. There are two hot water heaters so you don't have to worry about cold showers and the water pressure is strong enough for both showers to be used simultaneously! Other creature comforts include: surround-sound stereo, flat screen LCD televisions, DVD players, large wrap-around porch with a ceiling fan, an outside shower with both hot and cold water lines for easy rinsing of sand from the beach, gas grill, coffee maker, blender, toaster, iron with ironing board, full size washer and dryer, unlimited long distance telephone service, and FREE WIFI! As an added bonus, enjoy select network and premium cable channels in High Definition (HD) - (ESPN, History, CNN, USA, A&E, Animal Planet, SciFi, TBS & TNT). Old Florida Village is a 75 cottage community with two pools (one of which is just three houses from Sweet Magnolia), white picket fencing, natural landscaping, brick paved streets and meandering walking paths. It is located on Scenic Hwy 30-A in Santa Rosa Beach between Gulf Place Town Center/Amphitheatre and Goatfeathers Restaurant. Old Florida Village was modeled after the famed Seaside community which is where The Truman Show with Jim Carey was filmed. Grayton/Watercolor/Seaside/Seagrove is just 10 minutes to the east and Seacrest Beach and Rosemary Beach is another ten minutes past Seaside. There is only one road into the neighborhood which creates a nice private feeling for adults and children. Take a stroll or bike ride around. Convenient bike rentals are available in the area. Traveling west from Old Florida Village, Sandestin's Baytowne Wharf and Silver Sands Factory Stores (the nation's largest designer outlet mall) are only a ten minute drive and the new Destin Commons Mall and Movie Theater is another five minutes past Silver Sands. 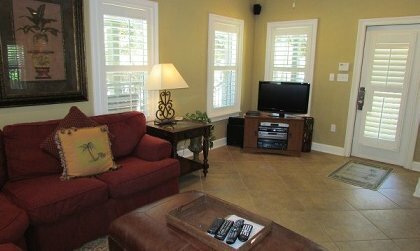 The Destin Harbor is approximately thirty minutes from Old Florida Village. In addition to these attractions, there are many golf courses, outdoor music venues, biking and walking trails, and many other activities the whole family can enjoy! 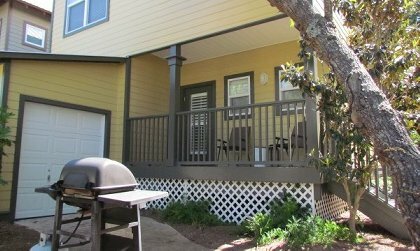 SWEET MAGNOLIA RENTS SAT-TO-SAT DURING SPRING & SUMMER. BEACH ACCESS IS 6/10'S OF A MILE: A 10 MINUTE WALK, 5 MINUTE BIKE RIDE OR 1 MINUTE CAR RIDE ACROSS THE STREET. THE 'GULF VIEW HEIGHTS PUBLIC BEACH ACCESS' HAS PLENTY OF PARKING, CLEAN RESTROOMS AND LIFEGUARDS DURING SUMMER.